Your Experian Credit Score gives you an idea of how lenders may view your Data Self (the version of you they see when you apply for credit). How does your Data Self look? A credit score, also known as a credit rating, is a number that reflects the likelihood of you paying credit back. Lenders like banks and credit card companies will look at your credit file when they calculate your credit score, which will show them the level of risk in lending to you. The higher your credit score, the better your chances of being accepted for credit, at the best rates. Can you check your credit score for free? Your free score will be updated every 30 days if you log in. Your credit score is calculated whenever you apply for credit, such as a loan, credit card, mortgage, or even a mobile phone contract. How your score is worked out depends on the company you’re applying to – different companies have different methods, so your credit rating may vary between them. 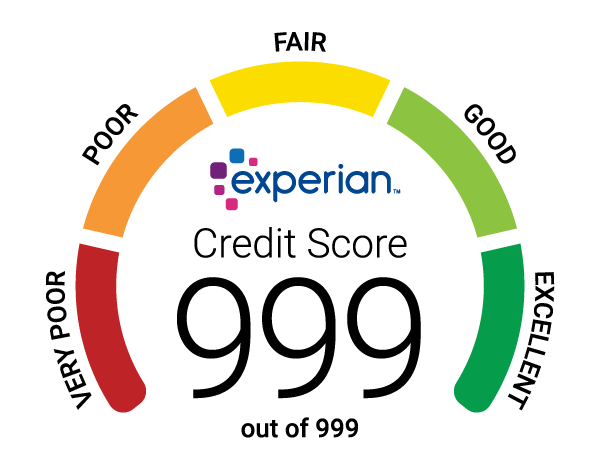 How’s your Experian Credit Score calculated? The Experian Free Credit Score runs from 0-999. It’s based on information in your Experian Credit Report – such as how often you apply for credit, how much you owe, and whether you make payments on time. You’ll lose points for having records on your report that may look negative to companies, such as late payments and defaults. You’ll gain points for things that companies usually view positively, such as consistently making payments on time and being on the electoral roll. What’s good or average credit score? There’s no ‘magic’ number that will guarantee you approval. And, because different companies may look for different things in their potential customers, you may be refused credit by one and accepted by another. We consider a ‘good’ score to be between 881 and 960, with ‘fair’ or average between 721 and 880. Your free Experian Credit Score can be a useful guide and gives you an idea of how companies may see you, so you can make more informed choices when it comes to credit. Remember, your credit rating isn’t set it stone – it’s a living, breathing thing that can change with certain kinds of financial behaviour. So, it can go up or down over time.